It was the performance of his life! Devon Petersen produced an incredible comeback to beat Ian White in a thrilling all Unicorn clash on Friday night. He won in a dramatic final set tie-break to reach round three. Also on Friday, Dimitri van den Bergh was brilliant in beating Jonny Clayton......Kyle Anderson came through a tough test against Noel Malicdem of the Philippines and Keegan Brown was a winner in the all Unicorn showdown with Jelle Klaasen. But Devon was the star of the show as White’s woes in big TV events continued at the Alexandra Palace. Well, next stop is a game with Steve West on December 27 in round three. There was no clue of the drama to come as a brilliant White raced into a two-set lead with a 109 average as he won six legs out of seven. That was the signal for Petersen. It was phenomenal stuff as the first 15 legs were won in 15 darts or less. Both were hitting 180s for fun. Petersen hit six perfect darts in the third set and as White started missing doubles, especially ‘tops’, he won six of the next eight legs and it was two sets apiece! 110 finish from Petersen to break, 106 from White to level....96 from White then the South African forced the tie-break. Dramatically he missed seven darts to break but he hit back with a 12 darter and a 125 check-out. Despite a 10th maximum from White, he missed two more at ‘tops’ and Petersen did break this time before following up with a superb leg to complete a fabulous victory. Dimitri van den Bergh was excellent as he saw off Welshman Jonny Clayton and the Unicorn ace will face another young gun Luke Humphries in the 3rd Round. In truth but for missed doubles, he would have won 3-0. He scorched through the opening set with three 13 dart legs and an average of 115.62. Missed chances cost him the second set but he took his 180 tally to seven in restoring his lead. Clayton went two clear in set four but back came Van den Bergh. A 108 finish, then a 14 darter and a brilliant 8th 180 to set up a 72 finish to win. Aussie Anderson was pushed all the way by Filipino Noel Malicdem before going through 3-1. But it was very close. 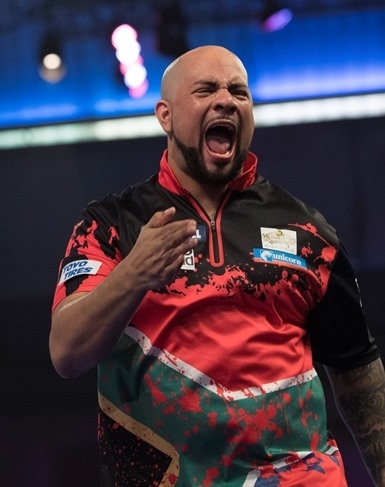 The Unicorn man took the opening set in a deciding leg despite finishes of 122 and 140 from his opponent and it was Malicdem who levelled in a second set deciding leg after Anderson failed to get a dart at a double with six darts from 131. The third set was full of drama. Anderson threw for it only to be denied by a brilliant 13 darters. In yet another last leg decider, Malicdem missed four darts to win it and Kyle pinched the set on D10. It turned the match as Anderson raced to victory without reply in set four. A 97 average and seven 180s and a clash with youngster Nathan Aspinall, who produced another huge upset coming from two sets down to beat Grand Slam Champion Gerwyn Price. Keegan Brown won a low key all Unicorn match up with Jelle Klaaaen by three sets to one and now faces a huge Unicorn showdown against James Wade in the 3rd Round. The Dutchman missed eight set darts before finally hitting the front, but that was as good as it got for Klaasen. He won only two more legs as Brown took control. He only averaged 82 to Klaasen’s 79 but it didn’t matter. He had done enough. Brown dedicated the win to his wife Roz who has been poorly.